Sony Ericsson Walkman phone positioned to strengthen the position of handset vendors in the sector-oriented music. Not surprisingly, almost every type of mobile phone Sony Ericsson issued tend to zero in the market of young people with up-to-date and attractive design. As already explained, the market potential of young people is a music phone. Proof that Sony Ericsson W395 is one of the latest Walkman mobile phone series with the fixed combination made the music plus the unique design. 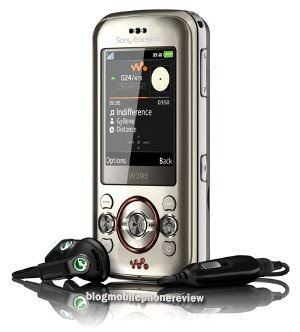 In fact, had called the W395 Walkman mobile phone that have a concept and has a sliding prices. Sony Ericsson W395 Walkman phone is a concept adopted sliding or slide. Overview of the views of, the phone still has a design similar to the previous Walkman model. But for some parts of the changes that have got innovative. There is a lustrous metallic material in the front combined with a plastic cover on the back of the body. Shapes are much smoother with a rounded shape on each side. Stereo speakers decorate the top and bottom of the phone is in the position attractive. At the bottom of the screen, there is a key characteristic property of Walkman series. Including some of the key standards (Softkey, call, reject), the music dedicated to plus key direction double function as navigation controls for the music player. Keypad of the phone has a button that is quite comfortable when the finger is touched. However, the material is a little slippery keypad when in use. But it does not affect the overall performance of the phone. 2 inch screen size (176 x 220 pixels) on the Sony Ericsson W395 is quite small. But already with the support by the LCD display 256 thousand color TFT with a resolution of 176 x 220 pixels. In addition, the surface of the LCD of the phone is already protected with a layer of special anti-scratch. Exploring the interface of Sony Ericsson W395, it will be display with brightness and color composition is quite good. The icon on the standard Sony Ericsson menu interface, which represents mobile phone showing this dynamic, fresh and attractive. Unfortunately only offers a model grid alone, without any variations. The music should be the mainstay of the main entrance in the mobile phone in the Walkman family is not able to appear good. The elements of music in the W395 was not so optimized. See, the music player in this series are based on the old version. Unlike the user interface on some Walkman phone that is up to date, users still have to sort of track artist and album or do a search from the list of songs on the phone. In addition, support features in the media player can be more optimized. Meanwhile, from the performance, the audio quality of the W395 even though relatively standard but good enough and satisfying. When used to listen to music from the speaker default, the sound that came out loud and clear although not optimal. So also when listening to music from the headset stereo. The rest, the TrackID enough time to help record a few songs that feel less familiar. Because, with this application user can do a search to Gracenote Mobile MusicID database to search for the title track and album artist and performers. Now when the phone is not equipped with a camera it's not complete, then the Sony Ericsson W395 features given the 2 megapixel camera. But please note, there is a camera that is integrated in the phone is not supported with some important features that are quite common. There is no autofocus and flash, W395 can not maximize the minimum condition in the light. Nevertheless, the quality of the W395 camera poto relatively adequate. Moreover, the support features to maximize the results poto also have a camera in this phone. There autofucus, lights flash and a few other settings. Besides images, W395 camera can also be used to record video. Format that produced the minimum that is slightly 3gp with a resolution of 176 x 114 pixels. Absent its 3G features to be one thing worth highlighted. Result, the ability does not have a video call on the phone. But to the phone right now, the presence of 3G has become a regular thing. W395 has only GPRS and EDGE capabilities. However, access to business data, which donated speed GPRS and EDGE on the phone this is quite satisfactory. Of fast and stable when used to open a wap and web pages. While for the Internet, WAP 2.0/xHTML, HTML is sufficient to bring the service quite good. Internet access via mobile phone is no longer making. In the profile settings bwoser also not difficult to use and relative ease. As a music phone that rely on connectivity issues to be the most important. Here is the Sony Ericsson W395 user needs. This mobile phone is supported with some means of data transfer such as Bluetooth and data cable. Performance of the two facilities owned W395 is quite good. bluetooth supports A2DP. While the data cable can be used to perform data transfer via PC. if you want to move the music files in large numbers, then the path v2.0 USB data cable that W395 will be very useful to make the transfer. If you are speaking of energy issues, the battery using the Sony Ericsson W395 Battery Lithium Polymer 950mAh capacity. In charging the phone once it can survive for three days. Compared with rival others in the class, W395 Walkman has not been able to offer more features. So if you can see that this model for entry-level market. However, from the price, is one of the W395 Walkman phone Sony Ericsson with the concept of sliding presenting most affordable price in the market. One of the advantages of this phone is in terms of design and good quality casing material. With the attractive physical appearance and class such as this, users can still be proud to use the phone as a grip. Wherein you can find out the owner of any cell phone or unlisted number. Results include, name, address,carrier and other details when available.Your search is confidential.